As home prices in major urban centers have lately gone through the roof, young families who can only afford tiny apartments are forced to find smart solutions that would still allow them to live comfortably in homes that they can afford. In particular, those with studio style apartments with no separate bedrooms, and couples with multiple kids that have homes with only one or two bedrooms, need to find ways to make the most of the space they've got. ​Many make use of sofa beds to save some floor space, but sofa beds come with some drawbacks: they do not resolve the problem of finding separate sleeping spaces for multiple people, they require the bedding (pillows, covers and sheets) to be removed and stored away each and every day, and they usually do not have any built-in storage space. Fortunately, there are nowadays various space saving smart bed configurations that could provide them with the solutions they need. This article will focus on three such smart bedding configurations which are very popular and easily achievable at relatively low cost. They are the Bunk Bed, Loft Bed and Captain's Bed. What makes these beds so desirable is that they don't just offer a compact sleeping solution, but also, depending on the selected type of configuration chosen, additional storage and office spaces. ​A bunk bed is a type of bed in which two bed frames are stacked on top of each other. These beds usually have no box springs as the two mattresses lie simply on a flat surface known as the "bunkie" board. The upper level of a bunk bed is usually surrounded by rails to prevent falling out during sleep. The two levels are supported by four poles, one at each corner of the bed. 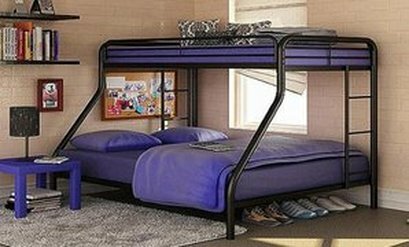 Though a ladder is usually used to reach the upper bed, bunk beds with built-in steps can also be found nowadays. Note however that to prevent accidents, the upper bed is not recommended for children under six years of age. 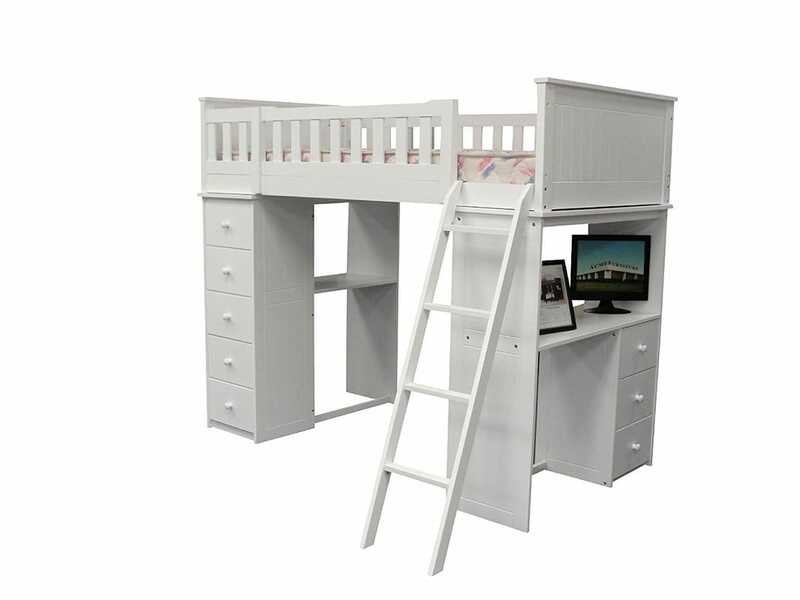 Nowadays, it is possible to find bunk beds that offer different sizes and shapes for the two levels. 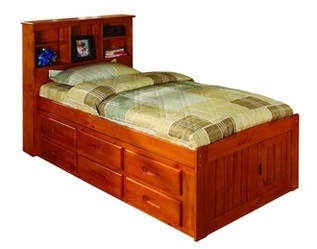 For instance, you could have one with a twin-size bed at the top and a full size at the bottom (see the above image). The main advantage of a bunk bed is that at least two people can sleep in the same room and in separate beds without requiring specific floor space for each person. This maximizes the available floor space for other activities in the room. Though bunk beds are mostly used to provide in the same room separate sleeping spaces for two children, they can also be used to provide guest sleeping when different sizes and shapes, like the one in the above picture, are chosen. So, if you have a small room where more than one person will have to sleep in separate beds, but with space for only one bed, you might want to consider the bunk bed. ​Note that if some prices are not shown on the Amazon link images below, they will be provided once you click the images. A loft bed is an elevated bed similar to the upper level of a bunk bed, but without the lower bed, providing additional available floor space for other built-in furniture such as a desk or a chest of drawers. This means that the loft bed makes use of the entire area under the elevated bed for office space, work space or storage. Note that to prevent accidents, the elevated bed is not recommended for children under six years of age. Usually, loft beds are more expensive than bunk beds due to the additional built-in features. So, if you have small room where there is not enough space for both a bed and a desk (or some other work area), you might want to consider the loft bed. A captain's bed is the simplest of the three types of space saving beds considered here and is simply a platform bed with drawers and storage compartments built-in underneath. So, if your main concern is simply finding space for additional storage in the bedroom, you might one to consider a captain's bed.